Nothing compares to the savory taste of a dish prepared with Italian white or French black truffles served at their peak of freshness. Americans are large importers of these fungi (importing 15,000-20,000 tons a year, according to Oregon mycologist Charles Lefevre), and there is also a growing industry of domestic producers in states like Oregon, California and North Carolina. 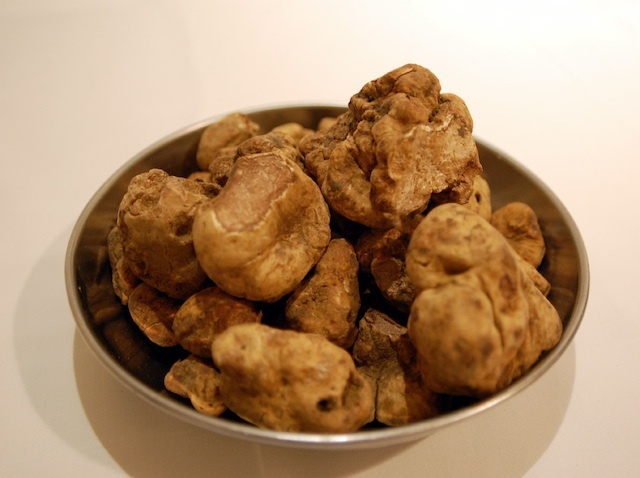 One of the most expensive and exotic foods on earth, premium white truffles (tartufi bianchi) can sell for up to $2000 a pound. Depending on the year, the season when they are available in the U.S. generally falls between November and March, with the supply of white ones usually over by the end of the calendar year. For those staying close to home: Recipes for Italian risotto vary---according to the region and season---but no risotto is better enjoyed on a special holiday occasion than the version made with white truffles. In a thick-bottomed sauce pan (preferably stainless steel), heat the olive oil and sweat the onion, shallot, fennel and garlic. Add the rice and toast it in the oil until it becomes slightly opaque, without browning. Add salt and wine and work into the rice with a wooden spoon. Reduce until it is almost dry and tastes sweet. Add more salt to taste and enough stock to cover the rice, stirring continuously to prevent sticking. Add more stock as the rice absorbs and sample its consistency. Continue process until the rice is just cooked. Remove from stove and add butter and cheese, right before serving. Shave generous amounts of truffle over the top. Serve immediately. This slide show offers a few creative and mouth-watering ways truffles can be enjoyed at restaurants around the country.